How do you know which solubiliser to select? This question comes up a lot and I actually struggle to answer it, not because I don’t understand the science, but because I do. Let me take a moment to explain. Some time ago I was formulating a spritz type product for a client and was becoming increasingly agitated at my inability to predict which solubiliser would work. I quite literally had to keep making up batch after batch then throw them away due to failure after failure. Now failure to adequately solubilise an essential oil into water (which is what we are talking about here for those who don’t know) can have a number of causes including poor manufacturing method, trying to incorporate too much oil, trying to solubilise vegetable oil components or addition of a disruptive preservative. I had already accounted for all of those factors so was pretty sure my issue was one of solubiliser selection only. Basically what a solubiliser does is to blend a little bit of volatile oil (usually an essential oil, fragrance or flavour) into a lot of water. The resulting formula is somewhere in the region of 0.1-2% oil with the rest being water or water-soluble additives. These products can then be called spritzers, toners, floral waters, deodorant sprays etc. After taking a step back from the lab to have a think I came to the rather logical conclusion that this solubiliser/ solubilised oil relationship was a game of two halves brought together in a nurturing and supportive environment – rather like when two potential lovers meet in a bar….. I started to look more closely at the chemistry of the essential oils that I was trying to solubilise and to simplify things I looked at solubilising single oils first. Basically an essential oil is a chemical soup with one, two or possibly three main chemical actives present. Some oils, such as Eucalyptus or Lemon are relatively easy to identify chemically with Eucalyptus being over 80% 1,8 Cineol and Lemon being around 70% Limonene. I came to the conclusion that if I could know more about the chemistry of these individual aroma chemicals I could potentially predict what type of solubiliser would help solubilise these ingredients into water. This assumption proved to be somewhat accurate. On learning what the key components of my oils were I looked up their structures as that would tell me if these chemicals were polar or not. Whether an ingredient is polar or not is very important as like dissolves like and as such polar chemicals are more likely to dissolve into polar solvents (water, alcohol) than non-polar chemicals (which are more likely to dissolve into vegetable oils than water). My theory here was that the more polar oil chemicals, the more likely they are to dissolve into water anyway so the less solubiliser might be needed. My other theory was that adding alcohol into the water phase would work against you when you are trying to dissolve polar chemicals than when trying to dissolve non-polar chemicals. This theory being based on the knowledge that water is more polar than ethanol. Polarity: Water > Glycerin > Ethanol > Acetic Acid (vinegar) > Benzyl Alcohol > DMSO (Dimethylsulfoxide). I also looked at the molecular weight of the major oil component as my theory was the heavier the molecule, the more solubiliser it might take to incorporate it into the mixture. I was basing this idea on density and the fact that if you match relative densities between phases you are less likely to get sedimentation or creaming of the product. After trying a few things out in the lab I still feel that there is merit in pursuing this. I tried to make sure that I was familiar with at least 60% of the oil chemistry in terms of its polarity and molecular weight before going any further as I felt that if I could predict solubility for the majority of the oil then I’d be more than halfway there. My experiments showed me that this was also a reasonable assumption. So after looking at the oil chemistry it was time to look at the water. Most people start off formulating very simple spritzers with just essential oil, solubiliser, water and preservative so that’s where I started too. I have already experienced the chaos that can happen when one adds Aloe into the water phase of some spritzers and wanted to just focus my attention here on the basics (Aloe is salty and adding salt ions into the water can decrease the Critical Micelle Concentration of an ionic solubiliser and increase the micelle size – more on this another time). I’d also advise anyone else looking at trying to optimise their spritz formulations to do the same – take out the water-based fluff first then add it back one by one to see how each thing affects your products clarity and stability. The ingredient that one can’t really avoid is the preservative and this can also bring a level of pain to the formula playing field. Preservatives work at the interface between the oil and water. Some preservatives do this very gently by finding a slot on the surface of the dispersed phase and leaving their bulk in the water phase without really interacting with the emulsion stability. Other preservatives work ON the surface, often lowering surface tension as that can help to ‘soften’ microbes so they can be killed. That lowering of surface tension can be a problem in a delicately balanced blend as there needs to be a degree of tension between the surface of the dispersed oil phase and the external water phase to keep the place in order – keeps the oil droplets small and spherical. If the surface tension drops dramatically the internal structure can collapse and the product turn milky or even separate fully. Preservatives that present themselves as ‘wetting agents’ too are often the culprits here and while I’d caution against thinking they can’t ever be used (sometimes breaking surface tension at least a little bit is a great thing for better spreadability) it is something to be aware of. Glyceryl Caprylate and Caprylyl Glycol are examples of this type of chemistry whereas Sodium Levulinate, Sodium Anisate and Phenoxyethanol are less likely to cause these problems. Rather than avoid trying different things out I’d advice formulators to just give themselves time to observe how their particular formula interacts with their chosen preservative system. It only takes a few minutes to see this for yourself after all! Bringing it together – the Solubilisers. So now it’s crunch time, how do we use all of this insight to help choose a solubiliser? Well, that’s where things get harder still. I was surprised by how little depth of reasoning I could find behind the chemistry of the different solubilisers available to the cosmetic chemist. I came to the conclusion that many ingredient manufacturers had just assumed that all you need for a good solubiliser is a high HLB. A closer look into this found some clarity in the pharmaceutical sphere – this paper was a big help. But first I’d better refresh the reader on HLB. So HLB is the Hydrophillic, Lipophillic balance and is a number assigned to a chemical to help you visualise or calculate how much it loves oil vs water or water vs oil. The higher the number, the more likely it will be to prefer water – numbers usually go up to around 20 for this application. Most solubilisers have HLB’s of between 14-20 meaning they like water a lot and oil a little bit. This makes them a logical fit for our formula which contains a little oil and a lot of water. However, HLB isn’t everything as we shall now see. Just as the chemistry of the thing we are trying to solubilise matters so does the chemistry of the solubiliser and one of the key things here is in how it forms micelles. The word ‘micelle’ has become quite familiar to people because of micellar water but not everyone understands what that means. I like to visualise micelles as ‘ring-o-roses’ where the solubiliser, in the solvent (water) gets to a concentration where instead of wandering around aimlessly with no friends it forms friendship circles by holding hands or something similar. These little grouplets are called ‘micelles’ and they orient themselves in a way that is most comfortable for them, forming when the surfactant reaches an ideal concentration – we call that the ‘Critical Micelle Concentration’ and it is different for each surfactant. Solubilisation technology is mostly (if not always) non-ionic so these solubiliser chemicals have a water-loving and an oil loving end to them. In a formula like this where there is little ‘oil phase’ to speak of the oil loving end will congregate facing inwards with the water-loving end facing out only the oil loving ends will be empty until the oily thing to solubilise comes around. 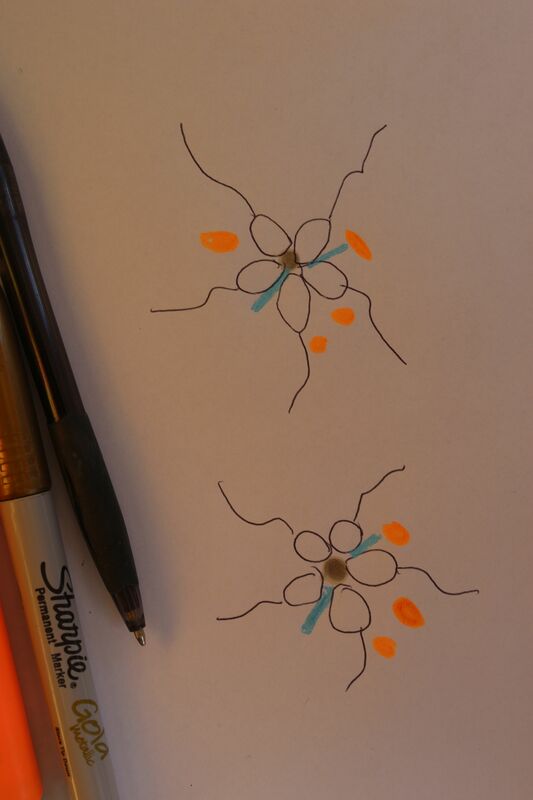 This terribly drawn picture below is my attempt to show a couple of micelles (the tadpole looking things in circular formation). When the perfume or essential oil is added it can fit into this merry dance in one of three places and be ‘solubilised’. It either slots into the middle- the hydrophobic core (shown here as a brown/ gold blob), slots in at the interface (joining the hand-holding ring – the blue bits) or fits in with the hydrophilic end of the micelles as per the orange blobs on here. Non polar aromatics will assume the first position inside the micelle while the water-insoluble polar aromatics will prefer the interface. 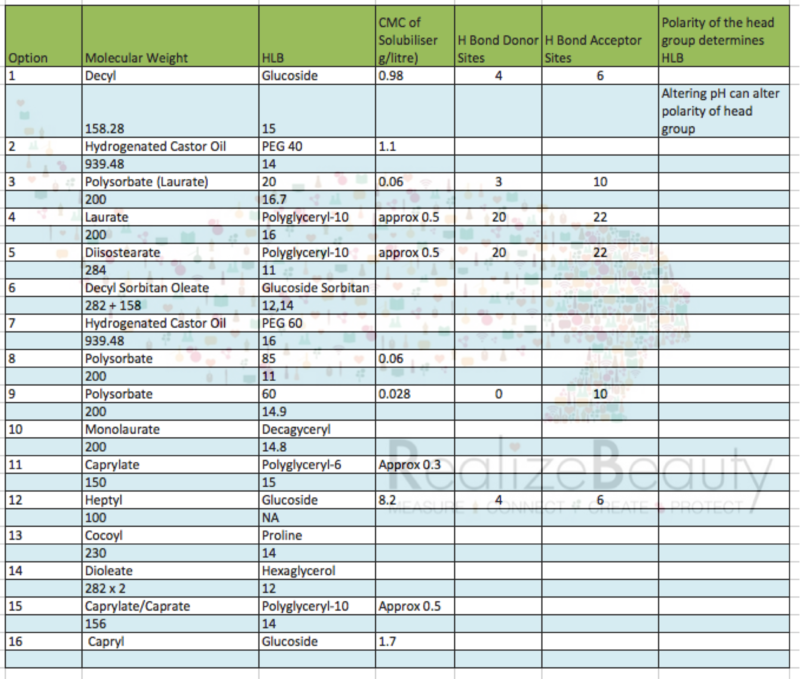 Some aromatics might also find a spot in the hydrophillic tail group and loosely associate themselves there. When I found out all of this I was excited as it really did seem like I could use this knowledge to predict where my ingredients of choice would sit and fit and be stable but oddly enough this wonderful insight has saved me only a fraction of what I thought it would in time in the lab – so far anyway. I think that part of the reason for that is because of the complexity of the ingredients we try to solubilise and the other part is probably because some solubilisers we use in cosmetic manufacturing were developed more for their high HLB than their micelle behaviour. Then again I could be wrong and it could be that I’ve just not tried enough things but the fact that I’ve found it so hard to gather data on CMC does lead me to the conclusion that ingredient manufacturers think it either irrelevant or haven’t realised how interesting it would be. See this from BASF who are pretty big in this area. With regards to CMC you will notice from the numbers that I have managed to find, that these numbers are very low and that in general, we would be adding our solubiliser at levels higher than the CMC in pretty much ALL cases (leading to the question ‘why would we bother with CMC then as we always surpass it)? But while we do surpass this concentration point, we are still trying to formulate using the lowest level of solubiliser possible to save us impacting negatively on the products aroma, skin feel (not too sticky) and cost. Even with that accounted for we wills still most likely use more solubiliser than the CMC so for me the value of the CMC is in giving us insight into how readily these surfactants form micelles and roughly how much of our added solubiliser will be in one. So, you not only have to exceed the CMC, but you have to exceed it by enough of a margin to give you enough micelles to accommodate your aromatic oil phase. By my reckoning the larger the CMC, the (potentially) more solubiliser you should be adding to guarantee that your aromatic oil meets up and interacts with a micelle. I think that this is why we are often told to use three times more solubiliser than aromatic oil to start with – to help shift the odds in your favour of having micelles and having micelles that ‘see’ the oil. Another angle to discuss is the shape of the solubiliser. Some solubilisers are pretty much small, simple heads and straight chain tails (Decyl Glucoside) whereas others are far more complex (polyglyceryl-10 Laurate). If we think about the micelles again, it is fairly easy to see how big chunky solubilisers with lots of tails might be able to catch lots of the polar but mostly hydrophobic aromatics in those swishy tails – rather like a fishing net. However, it might also be harder for these types of chemicals to welcome the non-polar components into their little hydrophobic cores, not least because the swishy tails block the way! It also seems rather logical to expect that big bulky solubiliser molecules might either not form micelles at all (this is possible) or, when they do they are either really big (so big micelles but less of them) or consist of relatively few individual units so are more loosely packed. How this impinges on the net result of solubilising your essential oil or fragrance is up for debate but unless you have lots of polar oils to solubilise I’d be leaning towards simpler structured solubilisers with bigger, more spacious cores as my preferred option. So what’s next? How do you know which solubiliser to collect. If you have managed to read through all of the above, been able to visualise what I’m going on about and still feel inclined to get in the lab then I applaud you! I’m sure that within all of this information will be a method of putting it all together in a simple way that can help shortcut the circuit but I haven’t found it yet. And even if there was a perfect calculator nature is always there to trip us up with an uncharacteristic batch of essential oil that doesn’t quite conform to our expected norm – this would be less likely to happen with a fragrance. What I’m hoping that this article does is underline the complexity of the science behind this. The science that underpins solubility, solubilisation and micelle formation helps us to deliver drugs perfectly, create sprayable micr0-emulsions AND make a good sprizer to help set your make up. I don’t so much mind that it is complex, it is always fun to grapple with a few concepts at once – stops the brain from atrophying but have I managed to save you or me any time as yet? Probably not. But hang on, maybe I have – I think what I have managed to do is bust the myth that just getting the right HLB will shortcut your problem. I think we can all agree that getting a little bit of aromatic oil into a lot of water is way more complex than that! On that note I had better go into the lab and see if I can add to this research and identify a pattern. ← Building an efficacious brand starts with knowing your actives.